I love when I can take one activity and adapt it to use throughout my caseload. It makes for Boo-tiful planning. 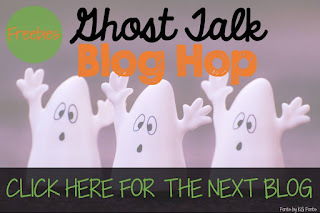 This Blog Hop should help you do just that. You will start here at the Pedi Speech where you will download the story "The Ghost That Wasn't Spooky". Next, you will hop through the Steech Attic, The Speech Owl, Sparklle SLP, Speech Wonderland, Speechasaurus and SLPTalk with Desiree (that's me!) where you will build your companions to the story. 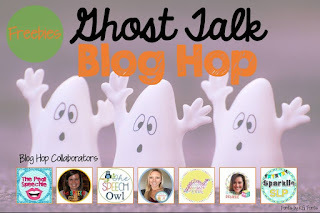 The blog hop loops around so if you happened to come across this post first, just follow along the links provided on each blog post to grab them all! My companion targets Social Skills. Students will love the interactive, self-checking format of this companion. Students select whether the behavior described is a a choice that one would expect and have positive thoughts about (thumbs up) or one that one would have negative consequences or provoke negative thoughts (thumbs down). Students can shine a flashlight behind the hole of their choice (through the back side) or they can fill in the circle with a wipe off marker. If shining a flashlight, a moon and stars will illuminate around the correct answer choice. There is also an answer key provided for those who prefer to check their answers in that manner. 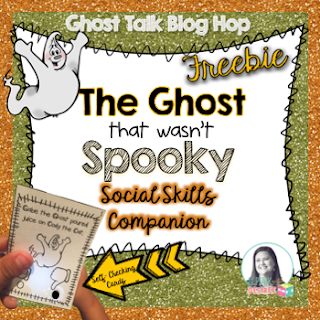 You can download my Social Skills companion to The Ghost That Wasn't Spooky here. Please remember to leave feedback for each product, even if it is free. Your feedback helps me know what your preferences are and inspires me as I create new products. After you download the Social Skills companion, hop on over to my sweet friend Sparklle SLP's site by clicking on the link below. You will love her wonderful Articulation/Phonology companion to add to the fun!